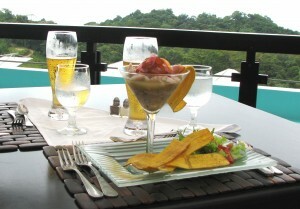 Ceviche (also spelled Cerviche) is almost as important to Costa Rica Cuisine as the ubiquitous Gallo Pinto. It can be found all over the country. From bus station counters to high end restaurants, you will almost always find this fish cocktail on the menu. I live in New Orleans, and I am a gumbo junkie. Working from essentially the same ingredients and spices, everyone here produces a different gumbo. All local cooks have their own recipe, and all are (usually) delicious. I almost always order a cup or bowl of gumbo when I see it on a menu. I want to taste everyone’s individual creation. Ceviche is the same way. It is served throughout Latin America. Every country, and every cook, has their own spin. But the basic ingredients in Costa Rica are fresh fish, lime juice, minced onions, cilantro and minced peppers. Some cooks add fresh pepper and salt as well. There are some variations and secret ingredients, and it is always delicious. The fish varies. Most of the time it is either Tilapia or Corvina (Sea Bass). I have also enjoyed excellent shrimp Ceviche. I have even had “meatless” Ceviche, that is made with chayote (a Latin squashlike veggie) or mangos. Ceviche is never actually cooked over heat. The trick here is that the dish is marinated in the lime juice, and the citric acid “cooks” the fish. It also adds a very nice astringent feeling on the palate. This is the perfect refreshing and cool snack to enjoy at a beach side soda (small outdoor restaurant) with a cold brew. Some places serve it with soda crackers, and some with tortilla chips. I prefer crackers. I also usually prefer tilapia over corvina, because I sometimes detect a slight fishy flavor in the corvina. But both are fine. The spices are usually pretty mild. So most of the time, I mix in a dash or two of hot sauce. I have “researched” this extensively. In no particular order, here is a list of my favorite ceviche in Costa Rica. So Far! Orquideas Inn, Alajuela. Served in a half a coconut shell, this tilapia ceviche gets high marks for presentation. But presentation means nothing if the ceviche isn’t good. This is very good. We stay at the hotel frequently, and this is usually what I am looking for as soon as I clear customs. I know that I have arrived in Costa Rica when I am sitting at the Marilyn Monroe bar with a Bavaria Gold and a “bowl” of this excellent ceviche. Salsipuedas, Manuel Antonio. All the fish at this tapas restaurant and friendly bar is good. The owner’s father once held the commercial fishing concession in this area. He grew up working with fish, and knows how to buy the freshest. Reasonably priced and mildly spiced. This is a great appetizer to enjoy before digging into the excellent fresh tuna (done several ways) and watching another beautiful sunset from their open terrace. Hotel Gaia, also in the Manuel Antonio area. A more upscale version, with some different ingredients. But this restaurant serves some amazing food, and the ceviche is no different. We like their Euro feeling and elegant open air restaurant, that feels more like seaside Italy than Costa Rica. Palenque Garabito. Located on the Pan American highway, between Puntarenas and the turnoff to Monteverde. This is a roadside soda, that is a slight cut above your typical soda. Of course it is open air, casual, and inexpensive. But the waiters wear ties, and seat you. The ceviche here, is an always fresh corvina version. This is a required stop for us whenever we pass by. During football (soccer) season, all the waiters line up in the dining area to watch the game and kibbutz with the Tico clients. True local color. If you happen to come across really good ceviche during your travels, let me know. I am always up for more research. Buen Provecho!